SVG 2 has a new ‘paint-order’ property which can be used to select the order in which the fill, stroke, and markers are painted. 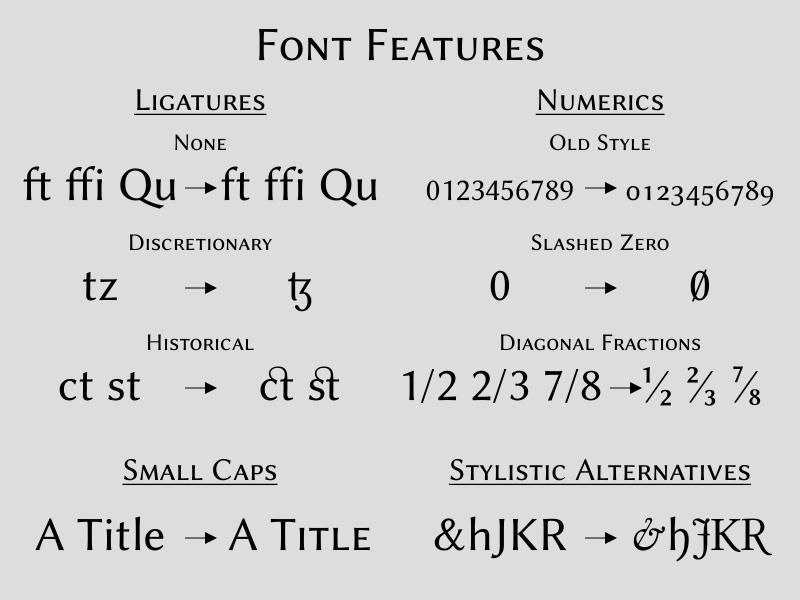 This is of especially great use for text where having the stroke painted on top of the fill leads to distorted glyphs. 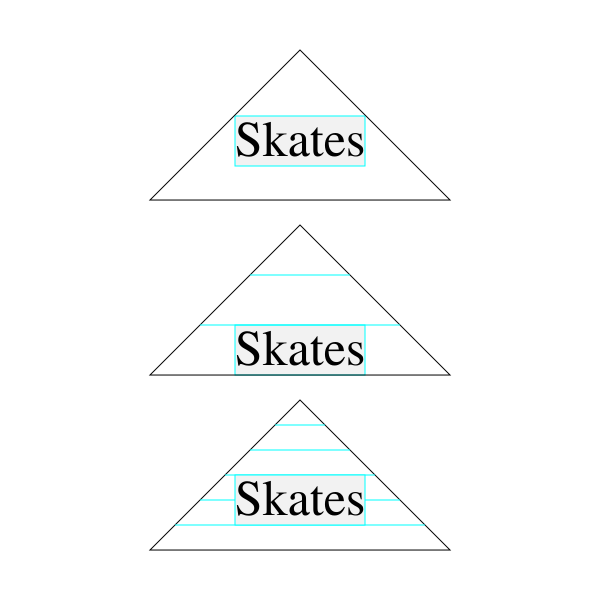 Sample text showing the effect of the ‘paint-order’ property. As of March 2014, Chrome and Firefox Nightly support the ‘paint-order’ property. 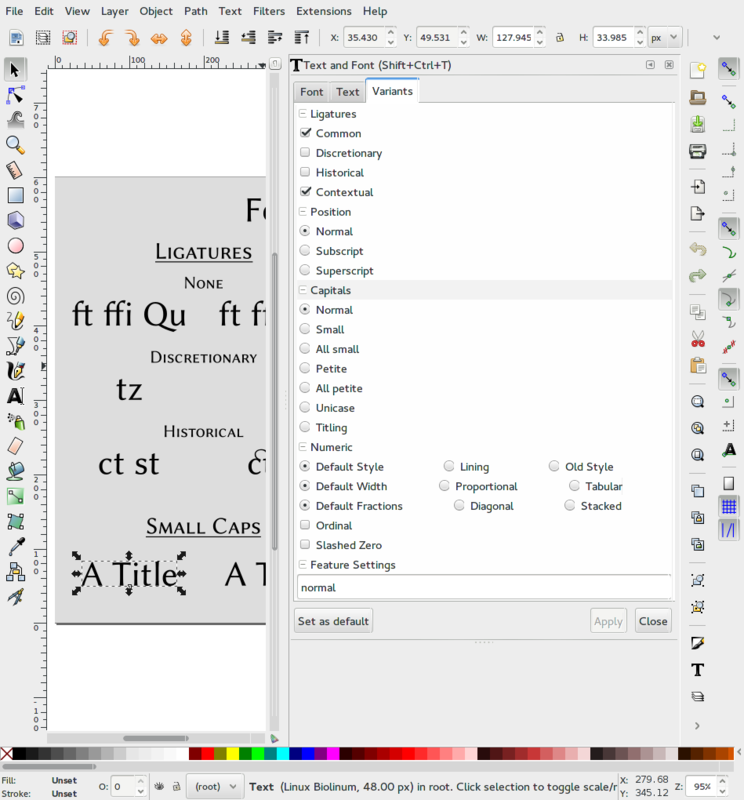 Inkscape trunk also has rendering support for the property (if compiled in). 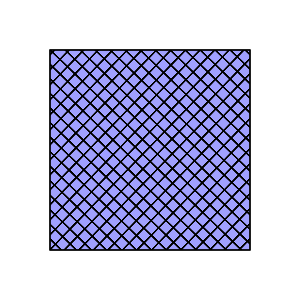 Each square has the indicated value of the ‘paint-order’ property. Each line of text has the indicated value of the ‘paint-order’ property. 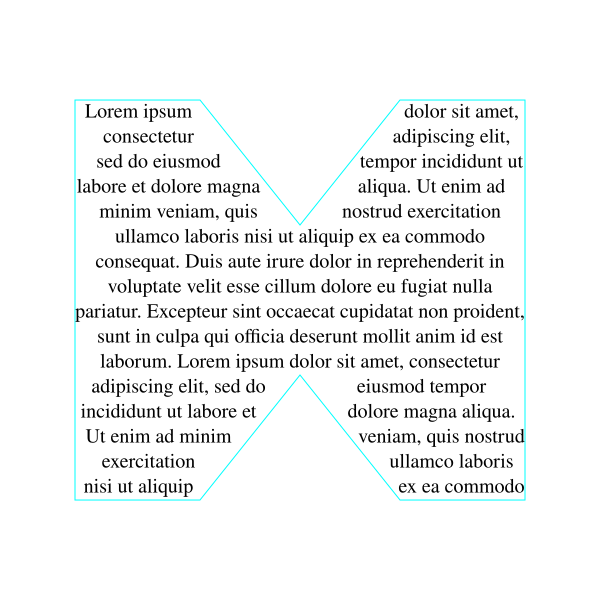 Inlined SVG. 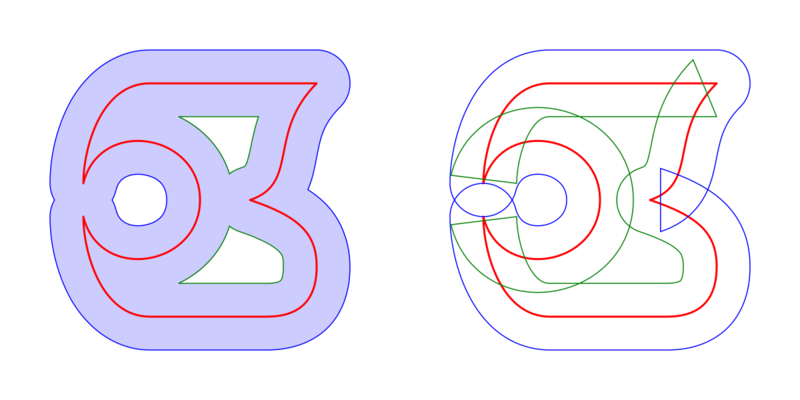 Circles drawn using painter’s model. 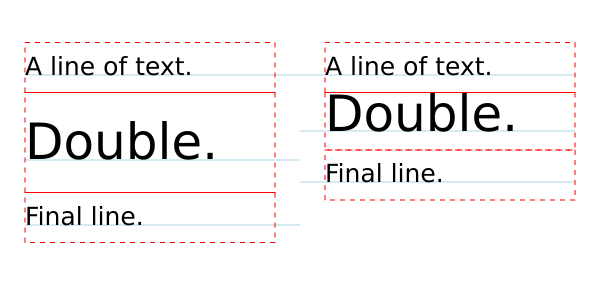 Inlined SVG. 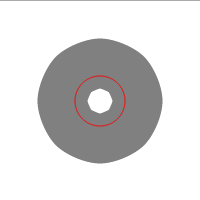 Circles blended with ‘mix-blend-mode’ = ‘screen’. I wasn’t able to get the ‘isolation’ property to work with Chrome (which should support it), thus I used a PNG in the above figure. At the SVG Working Group meeting last week, the group approved moving the CSS Compositing and Blending Level 1 to a Candidate Recommendation. Since this a joint specification, the CSS Working group must also give their approval. A Candidate Recommendation is the last step before becoming a Recommendation (i.e. an official W3C specification). During this last step two things must happen. First a comprehensive test suite must be written and second at least two different implementations must pass the tests for each feature in the specification. This latter requirement ensures that the specification is clear enough that it can be implemented (and also demonstrates there is a real interest in the specification). Chrome already implements the specification so just one more implementation is needed. It is expected that Firefox will soon support the specification. There is also a test plan that includes SVG tests. So we are well on the way to getting this through the last step. In addition, I’ve also just added support for CSS Blending to Inscape trunk. For the moment, a compile time flag must be set to enable the support. There is no GUI (other than the XML editor) and there is still a bit of work to be done (the Inkscape canvas background needs to be isolated from the drawing and I’ve seen a bug when part of the drawing is cached. The CSS Compositing and Blending Level 1 specification also include a full set of Porter-Duff compositing operators. For the moment, they only apply to Canvas. It was intended that they apply to HTML and SVG but the rendering models used by browsers cannot yet accomodate them. They will be included in the next version of the specification, CSS Compositing and Blending Level 2. The SVG working group approved the start on the next level at the last meeting. Blending and compositing has been included in SVG filters from the beginning. However, only a limited set of blending modes and compositing operators are available in SVG filters. Unfortunately, CSS Filters Level 1 has not extended filters to include the new blending modes and compositing operators despite being trivial to implement once the original set has been implemented (it took me all of an hour to add them to Inkscape trunk). Again the motivation is to speed up approval of the level 1 specification; level 2 will include them. Work on level 2 is expected to begin early next year. 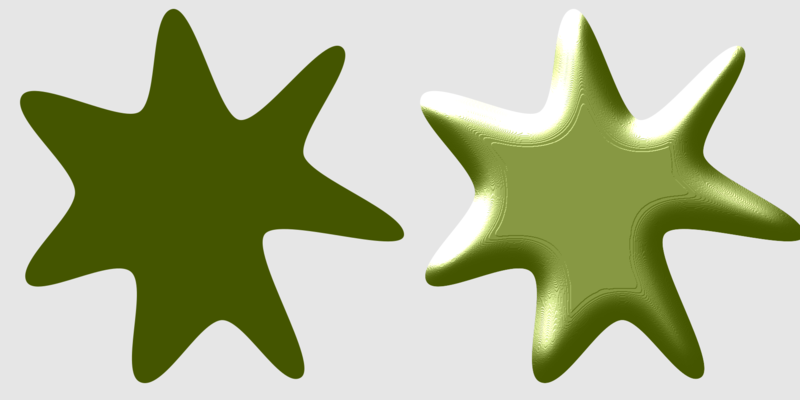 If you are interested in playing with then new blending modes and compositing modes in Inkscape, check out Inkscape trunk and set the flags WITH_CSSBLEND and/or WITH_CSSCOMPOSITE (see the file configure.ac). As mentioned above, there is no GUI for the new non-filter based blending modes. The new blending modes and compositing operators for filters are available through the Filters dialog. You can also have a look at my Blending Test Page. 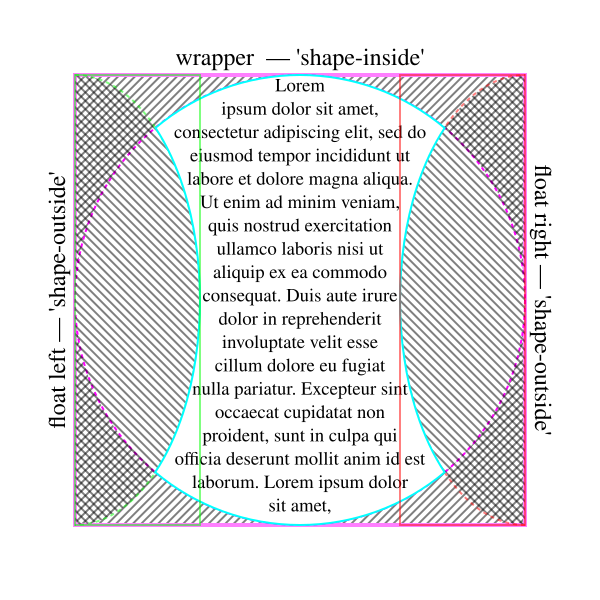 Wrapped text: I presented a proposal based on using the CSS Exclusions and CSS Shapes specifications. As I wrote earlier, the current Level 1 version of these specifications are missing the exact features we need, namely “shape-inside” (to provide a wrapping context) and references to SVG elements; both were recently removed. However, when we met with the CSS working group we were told that they would be back in the Level 2 specs. Alan Stearns promised to get the Level 2 drafts out soon so we have something to reference. Specifying only the “width” or the “height” creates an infinitely long rectangle for wrapping text. 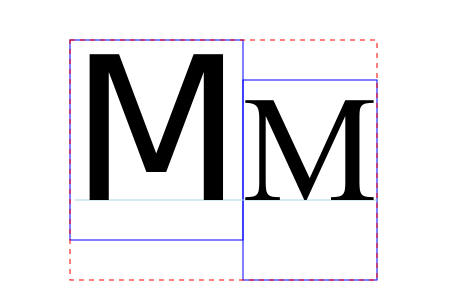 Specifying both creates a finite rectangle. The visibility of text that overflows this finite rectangle is controlled by the overflow property. One small problem with Doug’s proposal is that the values of “x” and “y” normally refer to the baseline of the first line of text and not the upper left corner of the rectangle wrapping area. This can be changed by specifying the “alignment-baseline” property to top or text-before-edge. Note that Doug’s proposal and my proposal are not mutually exclusive and we will mostly like incorporate both. Both the SVG and CSS working groups are amenable to the proposals. There are some details to work out. For example, in my initial proposal one would specify that text should flow sequentially into two different objects by giving a comma separated list: shape-inside=”url(#shape1), url(#shape2)”. This, I am told, won’t work as in CSS it indicates that the text should flow into the two shapes as if they were one shape. Instead, it has been suggested that either CSS Regions and/or CSS Fragments be used. This, however, seems overly complex. 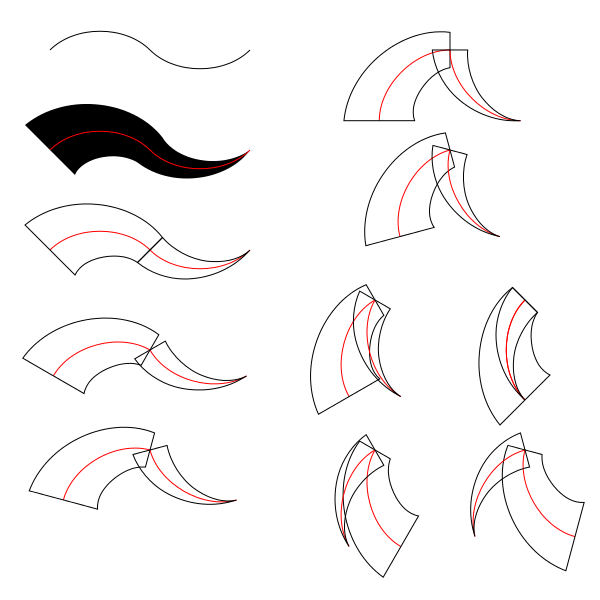 Possible ways to draw a “round” stroke-linejoin when there is a discontinuity in line width at a corner node. Top: using a “pen” with diameter of the smallest width. 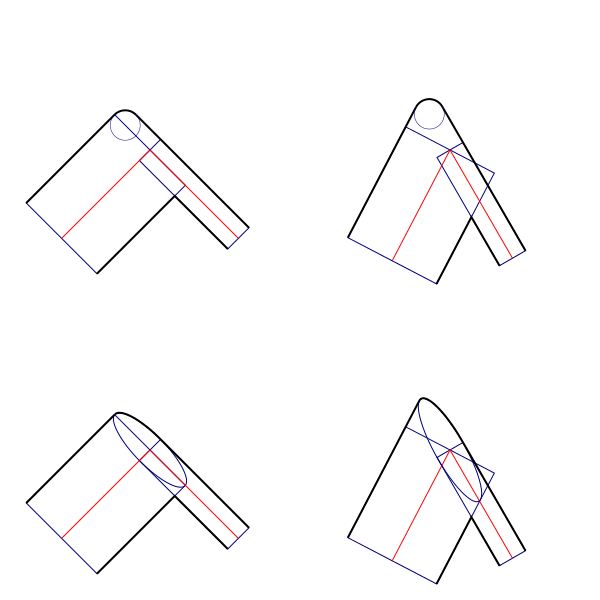 Bottom: using an ellipse. Circles and ellipses work well when the two line segments intersect at 90 degrees. At other angles or when the line widths are changing they aren’t as useful. Here is an attempt at using a Bezier with a handle length chosen so that it matches a “round” stroke-linejoin when the width is constant. 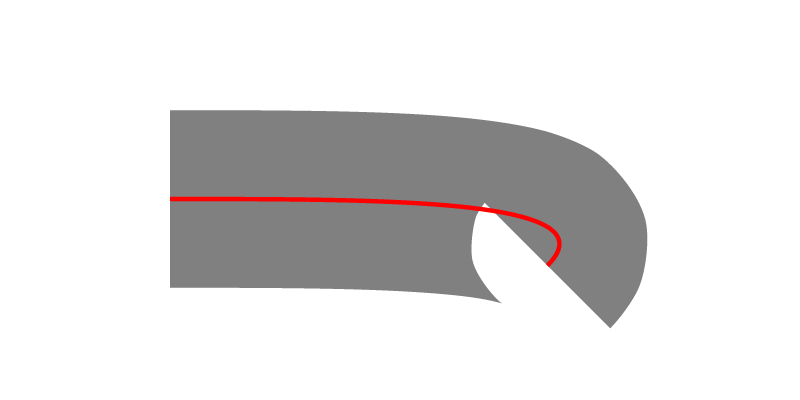 Possible way to draw a “round” stroke-linejoin: using a Bezier curve. 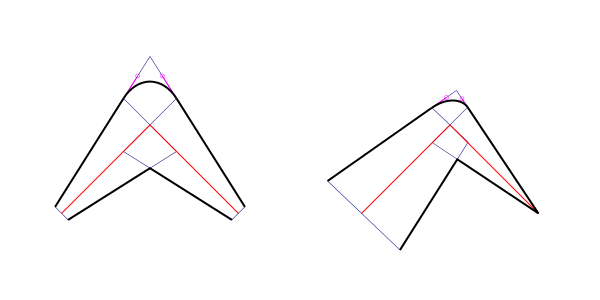 The handle length is calculated so that it reduces to a circular arc when the width is constant (length is 0.552 × angle between tangents in degrees / 90 × distance from end to intersection of tangents). The handles are shown in purple. A triangle shape is applied to a path with two sections. 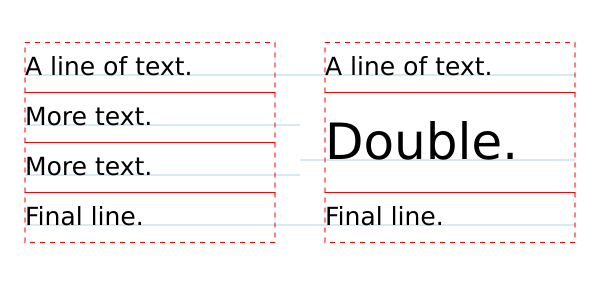 The angle between the two sections is changed from figure to figure. 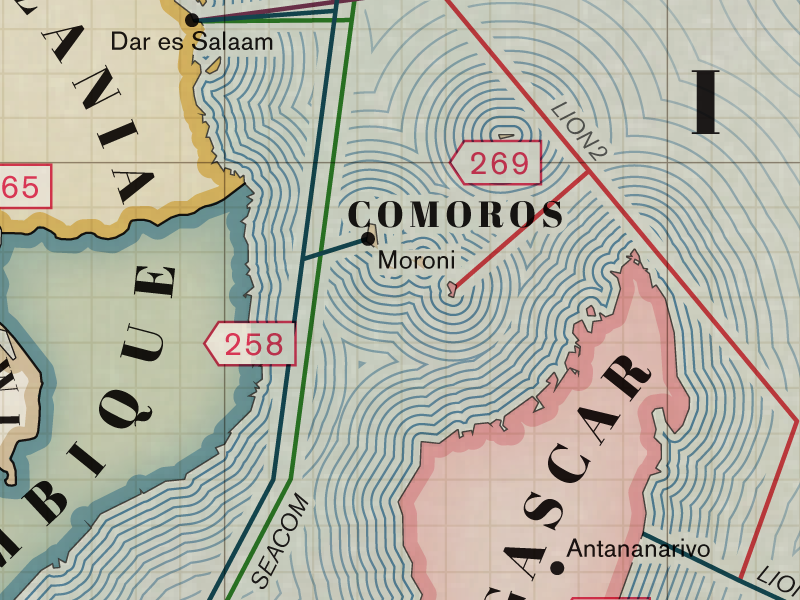 How would you construct a “round” stroke-linejoin between the two sections that works in all cases? 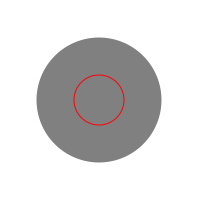 Marker rendering issues: SVG renderers differ on how markers are rendered for corner cases such as a polyline with one point (see: http://paullebeau.com/svg2/markers/). We sorted out the details. As part of the discussion, we agreed that markers should apply to rectangles, ellipses, and circles (and in the future stars). The basic rule, is that markers are drawn as if these shapes were rendered as paths. We explicitly decided that circles and ellipses would have four markers. Markers drawn on various shapes. 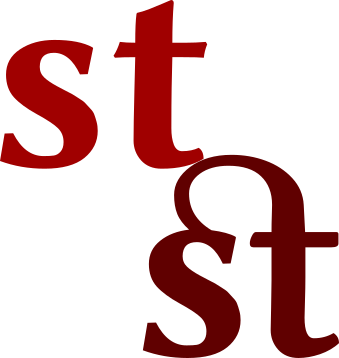 New value for the marker property orient: “auto-start-reverse”: This value indicates that a marker should be reversed if it is at the start of a path. This is so that one needs to define only one marker (like an arrowhead) and use it both as a start and an end marker (like a double-headed arrow). This has already been added to the spec and is in the process of being implemented in Firefox. 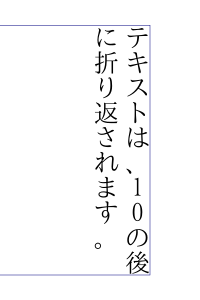 Path with just one defined marker using orient=”auto-start-reverse”. Hatch patterns: I recently added hatch patterns to the SVG 2 specification. The work was approved with a few small changes (renaming a property and specifying that only solid colors can be used… no hatches inside hatches!). Multiple fill and stroke properties: As part of our discussion of hatch patterns, we discussed the ability to specify multiple fill and stroke properties. This is useful, for example, to draw a hatch over a gradient fill, or in drawing cross-hatching. We agreed to how this would be specified. This is a first step to allowing things like multiple stroke widths and colors on paths but at the moment there is some resistance to handling these more complicated cases. The feeling is that we need to start limiting what is being added to SVG 2 so that we can get it finished. <rect x="50" y="50" width="200" height="200"
A multiple fill consisting of two hatch patterns over a solid light blue fill”. Filter compositing: feBlend: As anybody who has used the feBlend filter primitive to blend an element with transparency with a background image knows that the background gets added twice, once with the blending and once when the blend result is composited with the background. (See my example.) We can’t change the behavior of feBlend as there is too much content out there that uses it. We did agree to add a new attribute that will allow turning off compositing.